Stephen modified this former german army Unimog 1300L in campervan. Visit his web site and have a look to his trip to China on the "Silk road"
Jeff will help you to find a Unimog and to export the véhicule to the USA and Canada. All the details in his website. An old cousin of the Unimog, the French Renault TP3. The site of TP3 International Club of France and for those who own, have owned or would like to own a TP3. Bruno's web site records 916 camper service points and parking places in France + 35 in countries bordering France. Bruno is also an internet web expert. 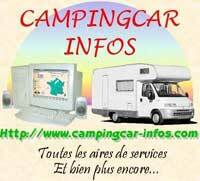 ABC.CAMPINGCAR puts together the links between the motorhome web sites . You will find the motorhome and accessories manufacturers, camper rental companies and personal web site pages.